Home All Events Seminar Series 2018 – Arul Jayaraman, Ph.D. The human gastrointestinal (GI) tract is colonized by approximately 1014 bacterial cells that co-exists with the host. The GI tract microenvironment contains a broad range of range molecules, including quorum sensing signals and metabolites produced by the resident microbiota, as well as hormones like norepinephrine and dopamine that are synthesized locally in the GI tract by the enteric nervous system. The close proximity of bacteria and the host cells, as well as the abundance of the signals they secrete, has led to the emergence of a new paradigm in which molecules produced by the host are recognized by the bacteria and vice-versa. The microbiota and the host not only recognize non-canonical molecules but can also further modify them to generate small molecules with a broad range of structural and functional diversity. Our central hypothesis is that inter-domain signaling between bacteria and host cells is a key determinant of homeostasis and disease in the GI tract. Specifically, we are investigating the role of these interactions in the sensing and migration of pathogens during infections, in the spatial organization and localization of bacterial communities, and in the modulation of host inflammatory signaling. In this talk, I will discuss our recent work on elucidating the role of microbiota-derived small molecules on inflammatory signaling and metabolomics approaches for discovery of bioactive microbiota-derived molecules in the GI tract. Dr. Arul Jayaraman is the Ray B. Nesbitt Endowed Chair and Associate Department Head for Graduate Programs in the Department of Chemical Engineering at Texas A&M University. He has a degree in Chemical Engineering from the Birla Institute of Technology & Sciences, Pilani (India) and obtained a Masters from Tufts University, where he worked with Prof. Edward Goldberg on Phage T4 tail fibers folding. He completed his doctoral work at the University of California at Irvine with Prof. Thomas Wood and worked on engineering biofilms for excluding sulfate-reducing bacteria. He joined Prof. Martin Yarmush’sgroup at Massachusetts General Hospital & Harvard Medical School as a postdoctoral fellow in 1998. He was promoted to Instructor in Bioengineering at Harvard Medical School in 2000 and developed a new thrust in living cell microarrays. 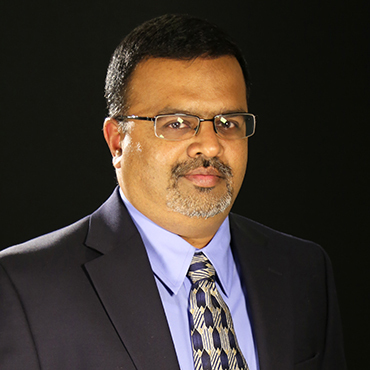 Dr. Jayaraman joined Texas A&M in 2004, was tenured in 2010, and promoted to Professor in 2013. His lab works on investigating the interaction between the intestinal microbiota and immune cells in the intestinal tract. He has won numerous awards including the Association of Former Students Distinguished Teaching award and Engineering Genesis award at Texas A&M. He is an elected fellow of the American Institute of Medical and Biological Engineers (AIMBE) and was recently named as a Texas A&M University Presidential Impact Fellow. Dr. Jayaraman’s research is funded by grants from the National Institutes of Health and the Cancer Prevention Research Institute of Texas (CPRIT).